Last October, the Museum of Geology welcomed our new Assistant Director, Danielle Serratos. Danielle was hired to supervise the museum’s exhibit floor and our continuous cadre of student employees tasked with managing the displays and informing our visitors. Danielle grew up in the small town of Rendon, TX, just south of Dallas-Fort Worth. Danielle cherishes her “best of both worlds” upbringing, combining the small rural community of Rendon with the immediately available urban hub of Dallas. Danielle received her BS in Geology from Texas A&M University Corpus Christi. 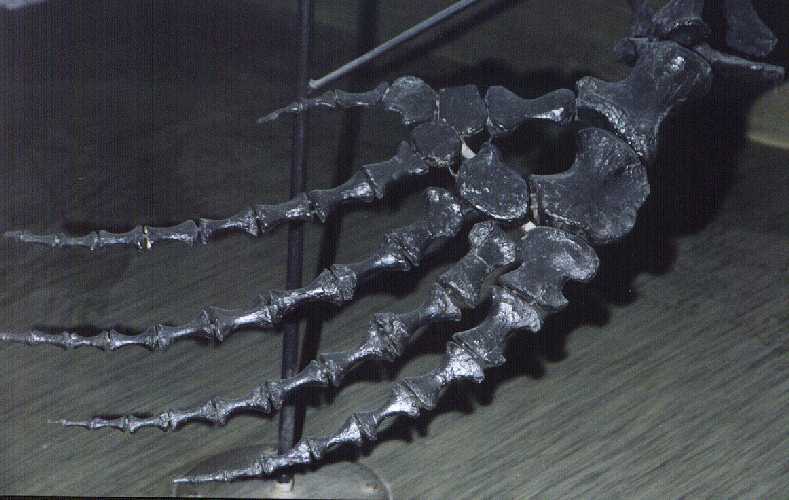 She then went to receive her Master’s degree from the University of Alaska-Fairbanks, where she studied the taxonomy and phylogeny of a unique specimen of elasmosaur from the Bearpaw Shale of Montana. Her interest in marine reptiles is part of what brought her to the Black Hills. Danielle with former SD Mines student TJ Hayden along the Missouri River in 2010. Danielle’s introduction to the program at Fairbanks has an interesting SD Mines connection. In 2010, while an undergraduate, Danielle attended a field camp in the Pierre Shale of South Dakota with former museum curator Jim Martin. Danielle expressed an interest in plesiosaurs, to which Jim suggested she read some of the work being done by Pat Druckenmiller at Fairbanks. Danielle liked what she read, applied, and was accepted to the program. The day before leaving she married her husband Carlos, a marine biologist, and they spent their honeymoon on the long overland trek to the Last Frontier. Danielle’s passion for fossils and marine reptiles started at TAMUCC. While she initially intended to focus on marine biology, she was drawn to the scientific mystery of marine reptiles. The complete lack of any modern analogs piqued her interest much more so than any existing organism. Fueled by collaboration with a local philanthropic organization that prepared fossils for donation to public schools, Danielle’s conversion to paleontology was gradual, but once hooked, she never looked back. Danielle is also exceedingly enthusiastic about public outreach. She began this side of her career as a GK-12 graduate fellow at Fairbanks organizing the Discovery Science Expo for Kids. The event was held annually at Fort Wainwright near Fairbanks and showcased science exhibits for the general public from four University of Alaska departments, the Museum of the North, and the Fairbanks Children’s Museum. Danielle is excited to be a part of the Museum of Geology team, particularly because access is freely available to the public. Additionally, she relishes the opportunity to train a diverse array of students to share their knowledge of geology with the community. She feels the ability to communicate science to everyone, not just the scientific community, is imperative for public acceptance of the value of research and science literacy. Danielle is also prepared for the challenges she faces in her role as Assistant Director, especially those that involve making the museum appealing to a broader audience. The specimens on display at the museum are not likely to change much, but their presentation and the information they provide can be adjusted to speak to a broader range of visitors with varying levels of education and cultural backgrounds. TW Tidwell at the excavation of Libonectes morgani. When asked about her favorite fossil, Danielle identified the gorgeous skull of the plesiosaur Libonectes morgani (Welles 1949). This specimen from the Eagle Ford Shale of Texas is the only uncrushed plesiosaur skull in the world, even containing a complete set of sclerotic ossicles. The specimen was discovered by a local farmer near Cedar Hill, Texas, named T.W. Tidwell while in residence on the Andy Anderson plantation. Mr. Anderson, upon donating the specimen to Southern Methodist University, made one simple stipulation that I’m sure Danielle would most emphatically approve of, “Write about it so common folks can understand.” (Shuler, 1950; p. 3). On September 1, we received two visitors bearing gifts for the Museum of Geology archives. Mr. Nason Hoyt arrived with his wife Beth to deliver an important piece of SDSMT history. Harry Keester of Imlay, SD. Nason’s uncle was Harry Keester, a long-time resident of Imlay, SD, and rancher who lived in the South Dakota badlands for most of his life. One of his favorite hobbies was searching for fossils in the Eocene and Oligocene sediments of the White River Group. One Sunday afternoon in 1947, Harry came across what appeared to be the tip of a large horn. After some initial excavation, Harry realized he was on to something big. He later talked with then Museum Director James Bump, who went out to check on the specimen with chief preparator Harold Martin. All three recognized the significance of the specimen, and excavation began a few years later in 1949. With the help of Harry Keester, the three embarked on a multi-week excavation of one of the most complete skeletons of the titanothere Brontops robustus to not only be collected by the Museum of Geology, but one of the most complete specimens to ever be documented. That specimen, SDSM 4912, is still on display and has since become the official mascot of the Museum of Geology. Nason and Beth Hoyt with SDSM 4912. On October 2, 1949, the Rapid City Daily journal published an extensive article on the excavation of the specimen. The headline “Fossil Find Tremendous” appears above photos of the excavation. Nason came across these articles among his uncle’s files and realized their importance to the Museum of Geology. Portion of the donated Rapid City Daily Journal article (photo courtesy Nason Hoyt). This donation represents a significant addition to the historical archives documenting past activity by museum scientists. Thank you, Nason, for this important part of our museum’s history! Work in the collections at the Museum of Geology is primarily student-driven, that is to say that students comprise the bulk of our workforce. We have active undergraduate and graduate programs filled with enthusiastic young people eager to learn the collection management trade. As such, we emphasize experiential learning working directly with collections materials. We’ve found students to be ideal participants in collection management endeavors because, with appropriate supervision, students regularly excel at all facets of collections management, including data acquisition, digitization, mapping, and dissemination in the form of website design, exhibit design, or blog entry. With such a large crew, collections are curated relatively rapidly as well. Collection management efforts augment classroom experiences in an excellent capacity. While we incorporate specimen work into the classroom experience, working with collections provides students with more freedom to acquire direct insight and solidify concepts they’ve previously only encountered in books or lectures. Working with collections is a fantastic way to emphasize taxonomy, phylogeny, morphologic variation, faunal interactions, field and laboratory procedure, and the need for proper documentation. Additionally, students often recognize and develop their own research projects throughout the course of their work. Josh Laird has been working in collections for two years on our IMLS grant. Josh has focused his efforts on the Gale A. Bishop collection of fossil decapods from the Western Interior Seaway. Josh has cataloged hundreds of specimens during his time here, and has developed many of the essential skills necessary for effective collections management. One of the best pieces of advice Josh can give based on his experiences is to keep thorough notes of your activities at all stages of work (field, lab, curation, etc.). Without detailed documentation, it is easy for you to forget what you’ve accomplished in your own efforts. This loss of information is only accentuated when people leave the institution or retire and a new generation has to interpret their efforts. Josh graduates in May with an MS in Paleontology. Brooke Long has been cataloging lucinid bivalve specimens associated with one of our NSF grants. She’s been working with both dry and wet specimens of Recent invertebrates. Brooke has been lucky enough to work with specimens she collected herself, and has gotten to experience the entire curation process, from acquisition through cataloging. Brooke stresses the importance of diligence and patience when working with collections. It can take many, many hours to make progress, and double checking your work for accuracy is imperative. But, she also notes that working with both dry and wet specimens has improved her recognition and appreciation of bivalve anatomy immensely. Collections management is a process best learned through active engagement with specimens. These and many more of our students will attest that this practice is an absolutely invaluable part of their training. So put those students to work, even if they may not be destined for a museum career. Lessons in diligence, patience, and documentation transcend vocation, and your students will be the better for their exposure to museum collections. For over a half century, Tullimonstrum gregarium, or the “Tully monster”, was an enigma. Discovered by amateur fossil collector Francis Tully in the Carboniferous Mazon Creek beds of Illinois, the creature was originally described by Richardson in 1966. However, it was very difficult to determine what, precisely, the Tully monster was. It has been compared to ribbon worms, bristle worms, snails, conodonts, and even the early arthropod Opabinia. Researchers found it challenging to classify this organism with its elongate body, cuttlefish-like posterior fins and bizarre proboscis. That is, until this Wednesday, when researchers from Yale published their findings in Nature Letters. They have convincingly shown that Tullimonstrum is, indeed, a vertebrate. Specifically, it is on the stem lineage to Petromyzodontida, or lampreys. The authors describe several vertebrate features, including a notochord, gill pouches, stalked eyes, and multiple rows of teeth at the end of the elongate proboscis. The results of this study are fantastically enlightening. They report segmented muscle masses, or myomeres (unique to chordates) that appeared to be segmented body sections. Decay had separated these segments, giving the organism an annelid-like appearance. They detail the presence of numerous, keratinous teeth within the proboscis, quite unlike the chitinous “teeth” on the radula of gastropods. The placement of Tullimonstrum within Petromyzodontida also reveals lampreys to be a much more morphologically disparate group than previously suspected. It appears as if early jawless vertebrates employed a number of differing feeding structures. These findings were possible only through examination of over 1,200 specimens within the collections at the Field Museum of Natural History in Chicago. The research employed a number of novel imaging and digital manipulation techniques to highlight and interpret much of the internal and external anatomy of Tullimonstrum. This was accomplished by compilation of hundreds of partial specimens to produce a complete picture of the animal’s anatomy. Much of this fossil material had been in the Field Museum collections for at least fifty years. The Tully monster illustrates the absolutely imperative need for research collections in the biological sciences. Acquiring and maintaining these collections constitutes the foundation, or “backbone” if you will, of rigorous biological research. Scientists and museum specialists in the mid-twentieth century had the foresight to collect, document, organize, and preserve specimens of Tullimonstrum, knowing that they were unsure of its affinities at the time, but that future researchers would have tools at their disposal to more accurately interpret the nature of these specimens. Biologic and geologic science would be impossible without research collections. Unfortunately, biological research collections are often targeted for budget cuts. They’re not at the forefront of scientific discovery. Specific specimens may be highlighted, but most material is never seen. However, the bulk of our accumulated knowledge is only available because of accumulated specimens. When these specimens remain behind closed doors, they receive little attention. When funds get diverted to “squeakier wheels”, silent paleontology, zoology, entomology, malacology, or botany collections suffer, because why devote time and money to dusty specimens in dusty drawers in dark rooms in the depths of museums. The revelations about the Tully monster this week were marred by the announcement that the National Science Foundation would suspend its Collections in Support of Biological Research (CSBR) Program for 2016. No new proposals in support of maintaining or enhancing biological research collections will be evaluated this year. This portion of NSF funding has systematically dwindled in the past decades. Grants used to be available for all manner of collections (geology, mineralogy). The focus was recently shifted to collections limited to a biological scope. Now, the entire program is on hiatus. This blog has been possible, in part, because of a CSBR grant involving recent and fossil invertebrate specimens in our collections. Our insight into biodiversity and evolution will be limited, or eliminated, if funds for collection upkeep are not available. As researchers, and concerned citizens, make your voice heard. Make it known that we need support to maintain these collections. The future of biological science depends on it. Now, I have to go update our collections move Tullimonstrum over with the vertebrates. In the 2003 Disney Pixar Movie Finding Nemo, a clownfish named Nemo has to navigate the hazards of both open ocean and captive aquarium life with a reduced front flipper. SPOILER: Nemo does fine, but actual organisms in the wild would likely not fare as well. Case in point, SDSM 32720, a partial skeleton of the mosasaur Platecarpus tympaniticus from the Niobrara Chalk from Tom Conger’s ranch on the southeastern flank of the Black Hills. The humerus of this specimen is figured below. Left: humerus of SDSM 32720. Right: Same humerus outlined to indicate displacement of anatomical features. Arrows indicate dorsoventral axis from an “unaltered” element. Dashed lines outline calloused area. Anyone somewhat familiar with mosasaur anatomy will immediately notice something amiss. In most vertebrates, the humerus is an elongate bone in the upper arm. Because mosasaurs evolutionarily convert their limbs to shortened “flippers”, all of the arm bones are, correspondingly, compressed, giving the humerus an hourglass shape. This humerus is unique. Below is the humerus of 32720 compared with a drawing of a “normal” humerus of the mosasaur Prognathodon. You’ll note that 32720 is, to put it gently, “messed up.” The distal, or bottom portion of the humerus is rotated approximately 30-40 degrees off center. This is due to a pathology, or evidence of a disease or injury. It appears as if this individual suffered a pretty severe break to one of its forelimbs. But, as evidenced by the thickly calloused area (dotted outline above), this animal actually managed to survive long enough to heal up. Additional images of the opposite side of the humerus are included below with comparison with a “normal” one. This poor guy endured quite the trauma. Additional elements currently being prepped, including the coracoid and scapula, show similar evidence of injury. It’s difficult to say what caused this injury, but a larger mosasaur or short-necked plesiosaur would be a good bet. SDSM 32720 compared to a drawing of a “normal” humerus from Prognathodon. Opposite side of SDSM 32720 compared with a drawing of a “normal” humerus from Prognathodon. This specimen is unique for two reasons. First, it shows firsthand how difficult life in the wild can be. Animals routinely suffer extremely brutal injuries. Despite these setbacks, many heal and survive long after the trauma. Pathologic evidence is common in vertebrate fossils, and has been reported in stegosaurs, tyrannosaurs, mammoths, saber-toothed cats, and may other taxa. Additionally, SDSM 32720 had already been partially curated. Several vertebrae and ribs were already in the collections. However, because this specimen was removed from multiple jackets, we only came across additional portions recently, several years after the original material was prepared and moved to collections storage. Proper documentation, from discovery to excavation to prep, has allowed us to reunite this unique specimen. Still Questioning Darwin After All These Years? “Nothing in biology makes sense except in light of evolution” (Dobzhansky, 1973). This statement is as true today as it was forty-three years ago. In fact, the influence of the Theory of Evolution has spread to include geology, ecology and much more of the natural sciences. The gradual change of Earth’s living biota over time in response to selective pressure has been shown time and time again to not only be the most viable and appropriate explanation for past and present biodiversity, but the ONLY viable explanation. And yet, on Darwin’s 207th birthday, we are still fighting for universal acceptance of one of the most validated concepts in science. I’m fond on telling my students that there is a wider array of TANGIBLE evidence for evolution than for gravity. The evidence for evolution literally surrounds us in the form of biodiversity, the fossil record, gene theory, antibiotic resistance, embryology, ontogeny, biogeography, homology, vestigial organs; the list goes on and on. But as scientists, we still have to battle for public acceptance of what should be considered one of science’s greatest explanatory triumphs. Since 2010, the legislative record in South Dakota is littered with a number of proposed bills intended to inhibit the free dissemination of evolutionary theory throughout public education venues. Although not as persistent an effort as elsewhere, some in our home state are consistently working to limit the spread of scientific knowledge among our population. These efforts lie in stark contrast to the immense body of tangible evidence to support the theory, in the form of the unparalleled fossil record contained in the western part of the state. Evidence for evolution is not only blatant in South Dakota, but contributes, in no small way, to the immense tourism revenue our state enjoys. So as scientists we have a duty, not only as educators, not only as thinkers, but as the intellectual legacy of Charles Darwin himself, to continue to inform, educate, and disseminate one of the greatest accomplishments of natural science. Keep fighting the good fight, colleagues and friends, and keep informing the public of the wonder that is evolution and science! Dobzhansky, Theodosius. 1973. Nothing in Biology Makes Sense Except in the Light of Evolution. American Biology Teacher. 35 (3): 125–129. Considerable parts of our holdings at the Museum of Geology were obtained from Lakota tribal land. This week, Sally Shelton discusses some of the specific issues associated with specimens under tribal ownership. The Museum of Geology is a repository for collections belonging to other entities. We provide curation and care for fossil specimens from a number of tribal, state, and Federal agencies, but they are the owners of their collections here. Some of the most important specimens we care for are from the fossil-rich lands of our Lakota friends and colleagues. In the past, these specimens were not treated in the same way as public repository collections. There was an assumption that collecting on tribal and even private lands without formal permits or permission was acceptable practice as long as the fossils came to the Museum. Today, we find that practice to be unacceptable. In the first place, we have no right to collect on any land where we do not have permission to be. We work with the landowners and land management agencies to ensure that our collecting is legal, accountable, and trackable. In the second place, fossils from tribal lands have deep value and meaning to the people of those lands. While some might consider scientific, historic, and cultural value to be three separate and different things, they are all one to the Lakota. Wilmer Mesteth, who was both a Tribal Historic Preservation Officer (THPO) and a spiritual leader at the Pine Ridge Reservation in South Dakota, once told us that there is not a fossil we could find there that does not have a traditional story associated with it. The Lakota know about the animals that once roamed their lands, and are the first people to name and describe them. We feel honored that Mr. Mesteth conducted a blessing and smudging of our new building before he walked on to the next world. A former curator of ours, Reid Macdonald, honored the Lakota tradition by creating scientific names for new taxa based on Lakota words. In cooperation with tribal members, Reid made important collections in the vicinity of Wounded Knee. Reid named such colorful taxa as the canid Sunkahetanks (“big-toothed dog”), the hedgehog Ocajila (“little oddity”), the beaver Capatanka (“big beaver”), and the ever popular primate Ekgmowechashala (“little cat man”). Partial jaw of the early Miocene beaver Capacikala (“little beaver”). Managing tribal fossil collections requires traditional as well as scientific knowledge in order to provide culturally respectful practices. A new generation of tribal paleontologists is tackling those complex issues, and we are honored to be a small part of preparing those experts for the challenges of good practice. As one of our Lakota friends told us, a good tribal paleontologist has a foot in each world, and knows (and preserves) the stories as well as the science. We now work with the THPO offices to determine best practices for the respectful care of their collections. This includes limiting non-tribal access to these specimens, selecting good-quality storage materials, keeping them out of the line of sight in storage through closed cases and shelf covers, and allowing ceremonial events to take place in collections. We do not use these specimens for teaching or research without getting the THPO’s permission to do so, just as we do with all our agency partners and stakeholders. Much of this is determined by the consensus decisions of the elders, who inform the THPO of the practices that are necessary. There is not a guidebook for setting step-by-step procedures for managing tribal collections in our care; we address concerns with the THPO on a case-by-case basis. As our documentation of these collections expands, we will share databases and other resources with the tribe. Wherever we can turn collections management into a teaching opportunity for tribal students, such as learning databasing, preparation, and collections management, we will do so. There is a major initiative to increase the number of people who speak the Lakota language, through everything from early childhood immersion classes to college teaching. We have discussed adding Lakota-language labeling to our exhibits and outreach materials. Fossils naturally intrigue and interest people of all ages; finding out the Lakota connections of many of our specimens would, we hope, get Lakota young people even more interested in learning the language. As we work more closely with the Lakota, we are creating more opportunities for students at Oglala Lakota College and SDSM&T to work together on fossil monitoring, collecting, preparation, and research. We have started looking at all of our collections as shared resources, and even started returning specimens that are more appropriately housed in tribal centers. This is not required by law, but is what we feel is the best ethical practice. It is time for many of these fossils to go home.